Have you ever heard Tim Gunn share on Project Runway. Edit, edit edit. Then there is the well known axiom that less is more. There is nowhere this is more true than in fashion design. Truth be told, sometimes I really enjoy unusual, busy designs. I love to step out of the normal and into the complicated. But it's with the full knowledge that I disappear. When it comes to being seen, your clothing needs to be well-cut, complimentary to your colouring/figure and draw people to you without becoming the focus. They should enhance what you have already - creating an ambiance to compliment who you are. 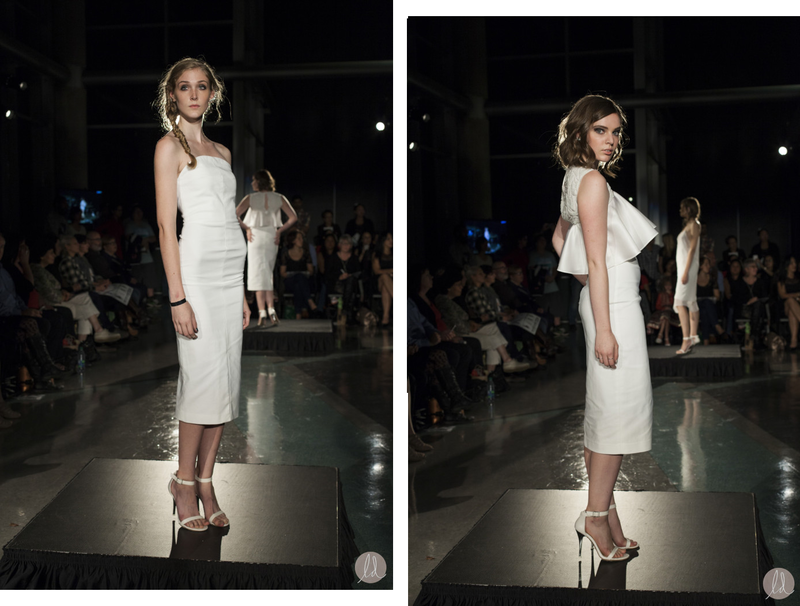 For her collection this evening, Vancouver Community College (VCC) grad Nikki Niknam brought all the elements: great construction, strong silhouettes and a simple palette (all white) so we could focus on her design work. My favourite is probably the layered outfit above with short jacket, soft longer top and to finish it off, skinny pants with an inside split. I would absolutely wear this - just not in white. My track record in white is very poor. 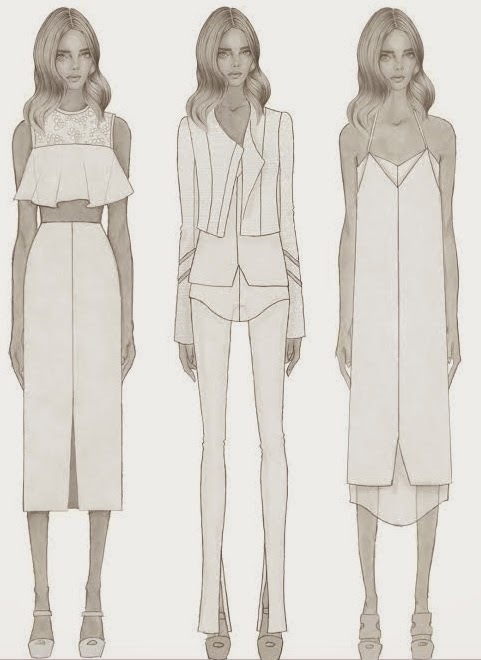 Niknam's collection also offered a great selection of separates to mix and match - top, pant, skirt, short and jacket - as well as a softly draped flowing dress with spaghetti straps. I think her line is on-trend with the needs of the growing 25 - 35 professional market. Versatile, well-cut and understated. You could walk in anywhere and present well. Want to know more? Here is a brief Q and A with the designer as well as contact information. Enjoy! I was born in Iran but raised in Japan, and Canada. I think I was shy. At lease that's what my mother told me. Mostly art. I honestly don't think I was was interested in much else. I was part of a lot of clubs and social committees but my favorite class was art class. Looking back, can you remember any signs that you would end up in fashion? Hmmm.... My mother sewed quite well so she would always made me little outfits. As soon as I was old enough to draw and to contribute my ideas she was able to make my designs for me. So I guess that's how it all started. A part of me always knew I would end up in fashion, I just wasn't sure which part. I thought I would be more into the business side but I actually love designing clothing and figuring how to make my designs. It's a very thrilling and satisfying experience. Why did you choose to study at Vancouver Community College (VCC)? I chose to study at VCC because it was a two year program and it was quite affordable. I'm really glad I went there. It was a wonderful experience and I learned a lot. The instructors are so supportive and knowledgeable. Lots of stress, fashion school isn't for everyone, it takes dedication and superb time management skills. Many of the students would break down in tears. If you don't love it it can be really difficult. My inspiration was my muse, the women I always envision when I design my collections. My collection is items you can wear during the day to full of evening wear. I wanted to show versatility in portfolio because I think that's important. It's contemporary women's wear with a sense of sophistication and modernity to it. I stuck to a subdued and refined color palette. Lots of greyish blue with dusty pinks. And lots and lots of white. 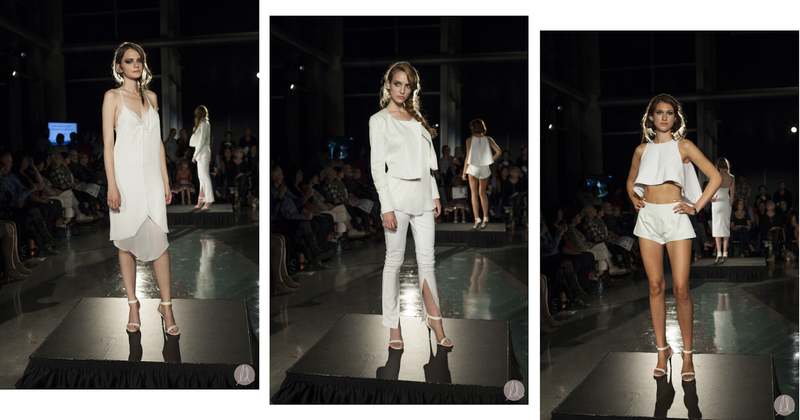 White is my favorite color so I used it a lot in this collection. I used silks, cottons, crepes and even some upholstery fabrics! Hmmmm - no, I worked so hard on each look that it's hard for me to choose a favorite. I'm not sure yet, ask me in a few years. I think I need to be the industry for a few years and see what is lacking and to see if I can fill a void but with my aesthetic and sense of style. Definitely work for someone else first. Learn as much as I can then start my own line, but not till I have a solid foundation built under me.